A gorgeous one bedroom attic apartment sleeping up to four people in a restored farmhouse on the Italian side of Mont Blanc in the Aosta Valley. It is set in the sophisticated Italian mountain resort of Courmayeur, in the heart of the skiing and trekking area at 1800m. Excellent for on and off piste skiing in winter and a multitude of activities in summer. 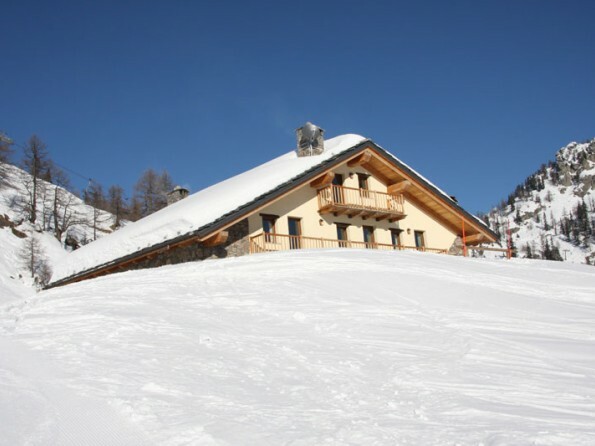 This is a wonderful place to stay is right in the heart of the Courmayeur ski domain. 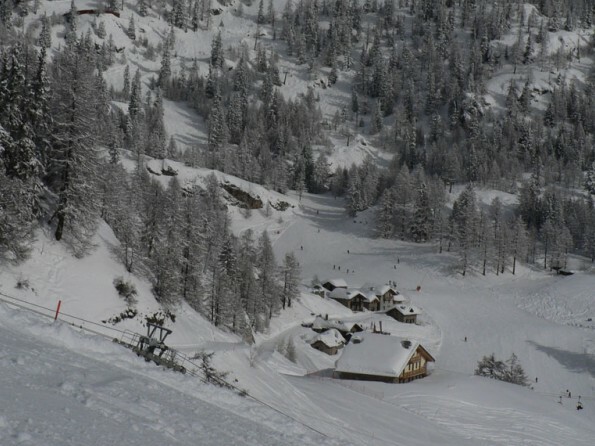 The chalet is at 1800m right in the middle of the ski runs. Winter access is only during the day by ski lift. It offers the perfect relaxing holiday by avoiding lift queues in the morning, having home always nearby and the perfect isolation of being up the deserted mountain in the evening. Be the first on the slopes as you ski down to catch the first lift of the day. In winter, discover and explore the amazing backcountry off piste skiing that gives you access to splendid solitude surrounded by Mont Blanc and the Aosta Valley's spectacular scenery and deep powder snow if you are lucky. We can organise a mountain guide to take you off piste or a ski instructor to improve your technique. Summer holidays offer wonderful walks, marmot spotting, peace and quiet. There is loads to do: treks through the amazing mountain scenery, mountain biking, exploration of the forests, day trips to Aosta to see the Roman remains, play golf in Val Ferret, a day trip to Chamonix, pick blueberries and mushrooms in the summer, walk 10 mins down the hill to the open air swimming pool. The chalet is directly on the path for the TOUR DE MONT BLANC as the walkers make their way down into Courmayeur coming from France. There is a bar and restaurant just 100 metres from the chalet and a busier very welcoming refuge 5 minutes on foot. This an ideal place to stay for families with children who love playing in the woods, walkers who want to admire the magnificent scenery and also for tired over stressed guests who want to lie in the sun and read a book all in the utmost tranquility. In the winter to reach the apartment guests must take either the lift from Dolonne (gondola) or Courmayeur (cable car) to Plan Checrouit and then the chair lift Maison Vieille or Pra Neyron. The last chairlift of the day is at 16.15 so guests must plan to take either the cable car from Courmayeur or the gondola from Dolonne by 15.45. The level of skiing required to reach the apartment is a decent snowplough and it is possible to reach the apartment on foot after taking the chair lift though it is not ideal for absolute beginners as there is a ski down to the ski school. ​In the summer the access road is from Val Veny passing by Pre de Pascal and the Corba Dzeleuna. Normal cars will have to park at Pre de Pascal and then we will ferry you up and down at beginning and end of holiday by Landrover. It is a half hour walk from the chalet to the car. At the bottom of the cable car and two minutes on foot. The attic flat is 40m2. There is a bedroom with 2 single beds. The living room has a double sofa bed and there is a further double futon under the eves. It is really too small for 6 adults so either use the sofa bed or the futon. The bathroom has a shower. There is a small but well equipped kitchen in the living room with gas hob, fridge, oven and dishwasher. The table sits 6 people. The flat is equipped with all sheets and towels, dishcloths and a basic supply of loo roll, soaps, salt, sugar etc. There is a sauna and large ski / bicycle room in the basement. The flat has a balcony facing south down the Aosta Valley. It catches the first sun in the morning as it rises over the mountains and is in the sun nearly all day. The whole flat is very llight. The owners live in Courmayeur and will meet you at the cable car when you arrive to give you a hand up the mountain and show you around the slopes. It is not easy taking suitcases up the lifts so rucksacks or shoulder bags are best. You can rent skis either at the bottom of the cable car or at Plan Checrouit. Food can be pre-delivered before your arrival if you give us a list before the snow comes (mid November). There is a bar/restaurant/pizzeria 100 mt away open all day, Snack Bar Ollier, which will remain open in the evenings if pre-booked and there is also a very lively refuge, Maison Vieille, just 5 minutes away on foot. They will come and pick you up by snowmobile to take you to supper and dancing! Shopping is done at the bottom of the Courmayeur cable car. The supermarket is 2 minutes on foot - you will need a rucksack. Weeks are from Saturday to Saturday. Prices include all bathroom and bed linen. Discounts available for longer periods. An additional 30€ cleaning charge is payable if the flat is not left clean and tidy on departure.